Harry Chesler (January 12, 1897, or January 12, 1898 (sources differ) – December 1981), often credited as Harry "A" Chesler, with the "A" an affectation rather than a true initial, was the entrepreneur behind the first comic book "packager" of the late-1930s to 1940s Golden Age of comic books, supplying comics features and complete comic books to publishers testing the waters of the emerging medium. Chesler's studio, which began in either 1935 or 1936, provided early work to artists and writers including Jack Cole, Jack Binder, Otto Binder, Charles Biro, Mort Meskin, and many others. Chesler was born either in Kaunas, Vilna Governorate in January 12, 1897, or, as given by his United States Social Security data, on January 12, 1898, in Jersey City, New Jersey. One source gives his birth name as Aaron Czesler, nicknamed Ari, the phonetic equivalent of Harry. That source says his parents, who were Jewish, married in 1895 and had two other children, Lena (b. 1896) and Sadie (b. 1900); the family immigrated to the U.S. in 1903, changing their name to Chesler. Most often credited as Harry "A" Chesler — the "A" was an affectation rather than a true initial, and Chesler sometimes quipped it stood for "anything" — Chesler was born in Jersey City, New Jersey, grew up in East Orange, where he graduated from East Orange High School in June 1915. He worked in his father's grocery and in the furniture business. He moved with his family to The Bronx, New York City in 1917. There is father bought a grocery wholesale firm at 1493 Zerega Avenue, with the family living nearby at 2903 Lyon Avenue. Harry Chesler registered for the draft on September 12, 1918, and served as a U.S. Army private during World War I. 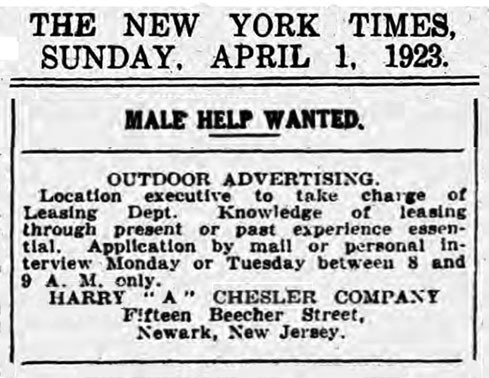 In 1919, after his discharge, Chesler returned to New Jersey, where he sold ads for The Jersey Journal and lived at 1463 East 100th Street in Jersey City. He also worked for a time at the Philadelphia Public Ledger, where he picked up his fictitious middle initial. By April 1923, he owned the outdoor advertising firm the Harry "A" Chesler Company of 15 Beecher Street in Newark, New Jersey. In 1928, he bought a 90-acre summer-home property in the Succasunna section of Roxbury Township, New Jersey, and opened a side-business dairy store. He would later live in Succasunna full-time. In 1935 or 1936, Chesler established a studio in Manhattan to supply comic-book content to publishers testing the waters of the emerging medium. The "Chesler shop" or "Chesler Shop", as it was informally called, was the first such "packager", later to be followed by companies including Eisner & Iger and Funnies Inc. Chesler in 1976 recalled it was located first at Fifth Avenue and 32nd Street, and later at Seventh Avenue and 23rd Street. George Tuska, a comic-book artist who had worked for Chesler in the late 1930s, recalled, "Chelser had his office on the fourth floor of a building on 23rd Street between Sixth and Seventh Avenue[s]". (One source lists the studio at 28th Street and Fifth Avenue.) During this time, Chesler commuted from his home in Dover, New Jersey. Chesler's early publications Star Comics and Star Ranger were produced through his own Chesler Publications, Inc. These were bought by Ultem Publications in 1937, where he continued as editor until Ultem was in turn bought by Centaur Publications in 1938. By the late 1930s, Chesler's packaging business was flourishing. As Tuska recalled, Chesler "did alright with comics. Bought a lot of property in Jersey. Made his own lake". Chesler employees remembered him as a tough but warm boss who always wore a hat and smoked a big cigar. Artist Joe Kubert recalled Chesler paying him $5 a week, at age 12 (c. 1938) to apprentice at his studio after school. Similarly, artist Carmine Infantino remembers that, c. 1940, he was paid by Chesler "a dollar a day, just [to] study art, learn, and grow. That was damn nice of him, I thought. He did that for me for a whole summer" while Infantino was in high school. Chesler's later imprints included Dynamic Publications, Harry "A" Chesler Jr. Publications, and Harry "A." Chesler Feature Jr. Syndicate. The covers of many of his 1940s comics bear the phrase "Harry 'A' Chesler Jr. Features Syndicate, N.Y.". or "Harry 'A' Chesler, Jr. World's Greatest Comics". Comic-book historians sometimes label all such imprints informally "Harry A Chesler Comics." In his heyday, Chesler recalled in a 1976 profile, "besides about 75 of my own titles, we produced comics for some 50 different publishers. At one time, there were 40 artists working for me and I had 300 comic titles on the newsstands." However, the Grand Comics Database records only 19 distinct titles directly published by Chesler between 1937 and 1946, leaving the meaning of "my own titles" in this quote unclear. His shop employed "a growing group of men who produced scores of strips [and] entire books (often first issues) for nearly every publisher," including Chesler's own Star Comics, Star Ranger, Dynamic Comics, Punch Comics and Yankee Comics. The studio also "[p]roduced the early issues of MLJ Publications Zip Comics, Pep Comics and Top-Notch Comics, Captain Marvel, Master," as well as features for Centaur Comics. Alumni of the Chesler Shop "went on to form the nuclei of various comics art staffs" for a number of different early comics companies; they include Jack Cole, Jack Binder, Otto Binder, Charles Biro, Mort Meskin, Creig Flessel (briefly), Ken Ernst, Bob McCay, Otto Eppers, and many others. Chesler's comics enterprise was severely affected by World War II. Chesler's main pre-war editor, Phil Sturm, was on active duty for most of the war, severely curtailing the company's ability to produce comics. Chesler's son, Harry A. Chesler, Jr., although listed in the business records as a co-owner in name, was never involved in the publishing business. Evidence from Chesler publications' statements of ownership during the war indicate that Chesler, Jr. was "on leave to the US Army." Chesler was briefly a partner with Archer St. John in St. John Publications in 1953. The studio was active through 1940, after which it reorganized and ran through at least 1953, though a former Marvel Comics editor-in-chief said in 1981 that from c. 1971–1975, the Chesler studio produced material for the Marvel Comics line of black-and-white magazines. Chesler married Hannah "Betty" Northay (b. 1897; d. October 16, 1977) on January 4, 1921, with the couple taking up residence at 165 Park Avenue in East Orange, New Jersey. They had two children, sons Harry A. Chesler, Jr. (b. December 9, 1921) and Arthur Bernard Chesler (b. January 26, 1923). In 1976 Chesler donated over 4,000 pieces of original comic book and comic strip art, much of it dating from the turn of the 20th century, to Fairleigh Dickinson University's Friendship Library. He died in December 1981, still living in Succasunna. ^ a b c Harry Chesler at the United States Social Security Death Index. Archived from the original on January 18, 2012. ^ a b c d e f g h i j k Saunders, David. "Harry "A" Chesler". PulpArtists.com. Archived from the original on November 11, 2016. Retrieved November 11, 2016. CS1 maint: BOT: original-url status unknown (link). Additional, archived on November 11, 2016. ^ a b c d e f g h i j Ewing, Emma Mai (September 12, 1976). "The 'Funnies' Can Be Serious". The New York Times. Abstract accessed on January 17, 2012. ^ Berk, Jon (June 22, 2002). "Harry 'A' Chesler, Jr.: Comic Book Entrepreneur". Scoop (Diamond International Galleries / Gemstone Publishing newsletter). Archived from the original on June 7, 2011. ^ April 1, 1923, The New York Times advertisement, via Saunders. ^ a b Cassell, p. 27. ^ a b c d e f g h Bails, Jerry; Ware, Hames (eds.). "Chesler Studio / Chesler, Harry". Who's Who of American Comic Books 1928-1999. Archived from the original on November 11, 2016. Quotes from print edition: Volume One (1973), p. 31. ^ Saunders, without citation of original source, quotes Chesler saying, " I moved into the comics business in New York in 1935. My first space was at Fifth Avenue and 32nd Street. I commuted from New Jersey for $6.45 a week. We put out a sixty-four page, four-color, comic book that sold for ten cents. In those days, paper was forty to fifty dollars a ton. I paid about a thousand dollars for the four-color plates for sixty-four pages. At one time, there were forty artists working for me." ^ a b Harvey, Robert C. (1996). The Art of the Comic Book: An Aesthetic History. University Press of Mississippi. p. 17. ISBN 978-0878057580. Much of this material was created by the first comic-art 'shop,' which had been set up in the summer of 1936 by a farsighted entrepreneur named Harry 'A' Chesler. ^ "Chesler / Dynamic : Chesler Publications, Inc. (Indicia Publisher)" at the Grand Comics Database. ^ "The Carmine Infantino Interview". The Comics Journal (191). November 1996. Archived from the original on January 17, 2012. Retrieved January 17, 2012. ^ Dynamic Comics, Chesler / Dynamic, 1941 Series at the Grand Comics Database. ^ Bridwell, E. Nelson (November 1974). "In Memorium: Otto Oscar Binder". The Amazing World of DC Comics (3): 30. ^ Wright, Nicky. "Seducers of the Innocent". CrimeBoss.com. Archived from the original on January 18, 2012. Retrieved August 29, 2008. ^ Wickham, Paul. "Jumbo Comics Comic Artists". Fiction House Comics (fan site). p. 4. Archived from the original on July 16, 2011. Retrieved August 29, 2008. ^ Bob McCay entry, Who's Who of American Comic Books, 1928–1999. Accessed Jan. 14, 2012. ^ Bails, Ware (eds.) Eppers, Otto. Archived from the original on March 3, 2016. ^ Sanderson, Peter and Peter B. Gillis. "Comics Feature Interviews Marv Wolfman" Comics Feature #12/13 (September/October 1981), p. 44. "Comics Veteran Harry 'A' Chesler Dies". The Comics Journal (71): 13. March 1982. Archived from the original on January 17, 2012. Retrieved January 17, 2012. Anarchists have employed certain symbols for their cause, including most prominently the circle-A (Ⓐ) and the black flag (⚑), although anarchists have historically largely denied the importance of symbols to political movement. Since the revival of anarchism around the start of the 21st century and concurrent with the rise of the anti-globalization movement, anarchist cultural symbols are widely present. Robert L. Wood (June 14, 1917 – November 7, 1966), was an American comics illustrator. Wood worked for the Harry "A" Chesler Company and provided art for multiple companies, including MLJ Magazines and Lev Gleason Publications. In 1942, Wood and Charles Biro co-created Crime Does Not Pay, a series largely credited with beginning the "crime comics" trend in the industry. Wood's personal life was marred by drinking and gambling addictions, and he served a total of three years and eight months in prison between 1958 and 1963 for manslaughter. A few years after his release, Wood was struck by a car and killed. Centaur Publications (also known as Centaur Comics) (1938–1942) was one of the earliest American comic book publishers. During their short existence, they created several colorful characters, including Bill Everett's Amazing-Man. Charles Biro (May 12, 1911 – March 4, 1972) was an American comic book creator and cartoonist. He is today chiefly known for creating the comic book characters Airboy and Steel Sterling, and for his 16-year run on the acclaimed 1940s series Daredevil Comics for Lev Gleason Publications. Enclosed Alphanumerics is a Unicode block of typographical symbols of an alphanumeric within a circle, a bracket or other not-closed enclosure, or ending in a full stop. There is another block for these characters (U+1F100—U+1F1FF), encoded in the Supplementary Multilingual Plane, which contains the set of Regional Indicator Symbols as of Unicode 6.0. Feature Comics was a comic book anthology title published in the United States by Quality Comics from 1939 until 1950, that featured short stories in the superhero and humor genres. The series was a continuation of Feature Funnies, a reprint collection of newspaper comic strips that was published by Harry "A" Chesler between 1937 and 1939, for twenty issues. Feature Comics continued the numbering with issue #21, and ran until #144. Fraktur (German: [fʁakˈtuːɐ̯] (listen)) is a calligraphic hand of the Latin alphabet and any of several blackletter typefaces derived from this hand. The blackletter lines are broken up; that is, their forms contain many angles when compared to the smooth curves of the Antiqua (common) typefaces modeled after antique Roman square capitals and Carolingian minuscule. From this, Fraktur is sometimes contrasted with the "Latin alphabet" in northern European texts, which is sometimes called the "German alphabet", simply being a typeface of the Latin alphabet. Similarly, the term "Fraktur" or "Gothic" is sometimes applied to all of the blackletter typefaces (known in German as Gebrochene Schrift, "Broken Script"). 𝖆 𝖇 𝖈 𝖉 𝖊 𝖋 𝖌 𝖍 𝖎 𝖏 𝖐 𝖑 𝖒 𝖓 𝖔 𝖕 𝖖 𝖗 𝖘 𝖙 𝖚 𝖛 𝖜 𝖝 𝖞 𝖟The word derives from Latin fractūra ("a break"), built from fractus, passive participle of frangere ("to break"), the same root as the English word "fracture". Fred Schwab (August 25, 1917 – May 13, 2000) was an American cartoonist whose humor panels and short features were published in a wide variety of comic books from at least 1938 to 1950, during a period fans and historians call the Golden Age of Comic Books. His notable comic-book appearances include Timely Comics' Marvel Comics #1 (Oct. 1939), the first publication of the company that would become Marvel Comics; and some of the earliest publications of the companies that would become DC Comics. Harry George Peter (March 8, 1880 – 1958), usually cited as H. G. Peter, was a newspaper illustrator and cartoonist known for his work on the Wonder Woman comic book and for Bud Fisher of the San Francisco Chronicle. List of Golden Age of Comics publishers. The Golden Age of Comic Books was a period in the history of American comic books, generally thought of as lasting from the late 1930s until the late 1940s or early 1950s. During this time, modern comic books were first published and enjoyed a surge of popularity; the archetype of the superhero was created and defined; and many of the most famous superheroes debuted. Comics "packagers", often operated by notable artists such as Will Eisner and Jack Binder, also formed during this time, to supply cheaply produced material to the burgeoning comics industry. The first publisher in this category was Dell Comics, established in 1929 although they started to publish modern comic books in 1935. This list ends in the mid-1950s, when many publishers went out of business due to the scapegoating of comics by psychiatrist Fredric Wertham and Senator Estes Kefauver, and the creation of the self-censoring body the Comics Code Authority in 1954. The debut of the new superhero the Flash in 1956 is generally considered the beginning of the Silver Age of Comic Books. Emmanuel "Mac" Raboy (April 17, 1914 – December 12, 1967) was an American comics artist best known for his comic-book work on Fawcett Comics' Captain Marvel Jr. and as the Sunday comic-strip artist of Flash Gordon for more than 20 years. Born in New York City, Raboy began his art career with the Works Progress Administration during the Great Depression. In the 1940s he began working with the Harry A. Chesler studio of comics artists. Raboy began drawing comic books and gained fame as the illustrator for Captain Marvel, Jr. and the Green Lama. Raboy was a great admirer of Alex Raymond, and "kept a portfolio of Alex Raymond's "Flash Gordon" comics by his side for inspiration and guidance as he worked". In the spring of 1946, King Features hired Raboy to continue the Sunday page adventures of Flash Gordon, which he continued to work on until his death. Drew Friedman has stated, "Raboy was an expert technician with pen and brush, and his lush covers are some of the most unusually beautiful ever to grace comic books". In written languages, an ordinal indicator is a character, or group of characters, following a numeral denoting that it is an ordinal number, rather than a cardinal number. In English orthography, this corresponds to the suffixes -st, -nd, -rd, -th in written ordinals (represented either on the line 1st, 2nd, 3rd, 4th or as superscript, 1st, 2nd, 3rd, 4th). 1º primo and 1ª prima "first, chief; prime quality". The practice of underlined (or doubly underlined) superscripted abbreviations was common in 19th-century writing (not limited to ordinal indicators in particular, and also extant in the numero sign №), and was also found in handwritten English until at least the late 19th century (e.g. "first" abbreviated 1st or 1st). Otto Eppers was an American cartoonist and illustrator active from the 1920s to 1950s. He is also known for a 1910 stunt in which he jumped off the Brooklyn Bridge. Succasunna is an unincorporated community and census-designated place (CDP) located within Roxbury Township, in Morris County, New Jersey, United States, serving as its downtown and population center, having a population of 9,152 people as of the 2010 United States Census. The World Wide Web Consortium and the Unicode Consortium have made recommendations on the choice between using markup and using superscript and subscript characters: "When used in mathematical context (MathML) it is recommended to consistently use style markup for superscripts and subscripts.... However, when super and sub-scripts are to reflect semantic distinctions, it is easier to work with these meanings encoded in text rather than markup, for example, in phonetic or phonemic transcription." Walter Cole Brigham (January 11, 1870 – August 7, 1941) was an American artist, now best known for his innovative stained glass techniques incorporating transparent shells, pebbles, and beach glass, and for his illustrations of pulp magazines. Brigham was born in Baltimore, Maryland, to Marion B. and William Theodore Brigham, who owned the Swift Meat Packing Company of Baltimore and the Greenport Shipbuilding Company of Shelter Island, New York. As a child, he lived at 406 Pressman Street in Baltimore. In 1888 he graduated from high school and entered Johns Hopkins University, but became ill in 1892 and did not complete his degree. He also studied at the Decorative and Maryland Institute Schools, received art training from André Castaigne, and later studied with William Merritt Chase (1849-1916) at the Art Students League. On December 8, 1892, the World's Fair Commission chose his design for the Maryland Medal. In 1898 he spent a year in Florence, Italy, studying art, returning in 1899 to his parents' home on Shelter Island. In 1906 he completed a stained glass window in memory of Brooklyn banker Frederick A. Schroeder in the Union Chapel in the Grove on Shelter Island, and in 1909 he created a similar design for actor William Gillette's houseboat. On September 23, 1911, he married Jeanette Lawson, with whom he had two sons. By 1926 he had begun to illustrate magazines, including Ginger, Pep, and Hot Stuff, and in 1928 his work began to appear in pulp magazines, including covers for Clues Detective Stories, The Dragnet, Rangeland Love, Popular Engineering Stories, and The Underworld. From 1935 to 1939 his drawings appeared in comic books produced by Centaur Comics, Harry "A" Chesler, DC Comics and Dell Publishing. Brigham died in 1941 at Shelter Harbor.